The delightfully low 66 MHz rated FSB speed provides a ton of headroom to exploit the CPU's overclocking potential. The new Coppermine (well, Celermine) core has support for Intel's 'new' Streaming SIMD Extensions (SSE). The 0.18 micron manufacturing process allows for less stringent voltage requirements. The default voltage for the Celeron 566 is set at 1.5v. Overclocking the 566 to 850MHz (with minimal cooling measures and no fancy PC133 RAM) has a startlingly high success rate. The price! 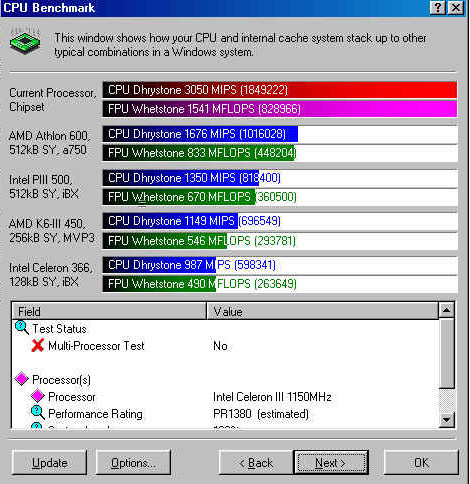 At almost 1/5 th the price of a P3 850, the Celeron 566 overclocked to 850MHz offers an amazing price / performance ratio. Of course, the smaller (50%) L2 Cache compared to the Pentium 3 does affect the performance, but not to the degree one might expect from this kind of a price difference (checkout FiringSquad's P3 vs.Celeron II article for the relevant benchmarks). Having said that, it's quite obvious that with the CII 566, you have a winner right off the bat. 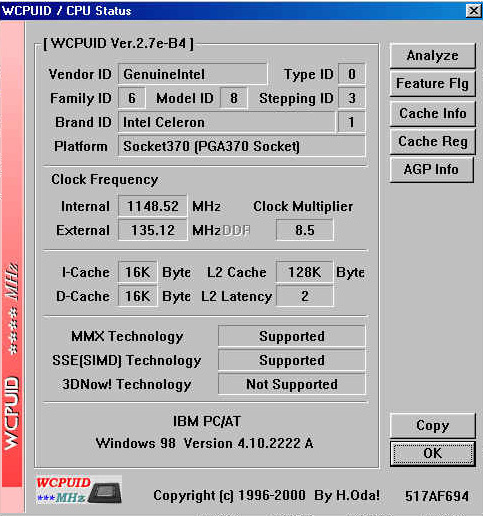 With minimal effort and investment, you can simply up the FSB speed, sit back, relax, and stare at that unusually high number (638, 708, 850 MHz) on the wCPUID window. On the other hand you could choose to maximize the Celeron's potential with a slightly more ambitious cooling project, such as the one described here. Mr.Komson Plangsiri of Bangkok, Thailand has given me permission to write a short article on his latest (extreme) overclocking endeavour: pushing the limits of this particular Celeron II. Mr. Plangsiri is one of a growing legion of extreme overclockers - guys who refuse to accept any fan as a cooling solution; the kind of guy who gets stressed out when the CPU diode reads any higher than -4 degrees celsius. At first glance, the Celeron 566 looks a lot like the new Coppermine Pentium3. With the flip-chip design and 0.18 micron core, the Celeron II is able to function at much lower temperatures than its predecessor, making it an excellent candidate for extreme overclocking. Of course, an inevitable consequence of extreme overclocking is the need for extreme cooling, and with that thought I'd like to introduce some of the cooling equipment used for this project. 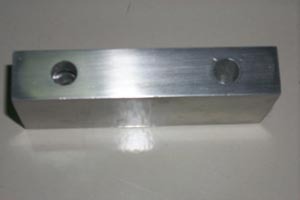 Seen above is the aluminum water block, chosen for its ease of use. The dimensions of this particular block is 2.5 x 13 x 5 cm. 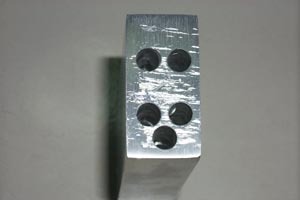 It's thick enough to allow for multiple drill holes that help to increase the contact surface area between the coolant and the block. 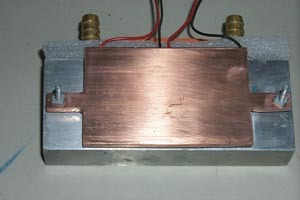 The picture on the right illustrates the slightly exaggerated length of the block, with 2 ports that will accept a TEC (Thermo-Electric Cooling node) each. 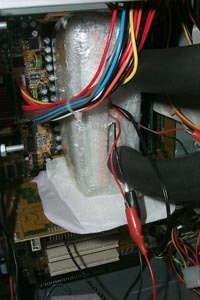 An Asus slotket was used (over the popular Iwill slotket) because its screw hole allows for an easier cooler installation while giving the overclocker the freedom to use 2 peltiers instead of one (as is the case with the Iwill slotket). As with most socket-370 interfaces, the Asus adapter's edge was slightly higher than the chip's core would be once mounted on the socket. 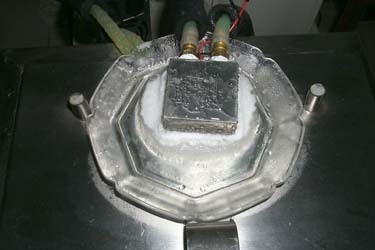 While not a problem for standard heatsinks, the raised edge proved to be an obstacle to installing a larger heatsink or water block. The only alternative in such a situation would be to either make the surface level using a spacer or to lower the edge by rasping it down. The first solution is not ideal, as we wish to eliminate as many contact layers as possible between the chip and surrounding plate & heatsink. The above pictures show the procedure and result. The pin hole was taped for protection during the process. With such an intense combination of extreme heat and cold, humidity and condensation become a potential hazard to the slotket. It may cause the system to lock up or an electrical short may occur. 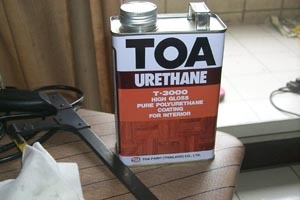 To prevent this, polyurethane was used to coat it. Two or three layers of liquid seemed to provide adequate insulation. As mentioned previously, the chip can be pushed to 850 MHz easily with almost no hardware tweaking. Komson pushed it to 950 MHz at 1.8 volts with a small heatsink then tested its stability using cpuburn (similar to the likes of other cpu-intensive programs like seti@home, RC5 client, 3D rendering, prime95, etc). 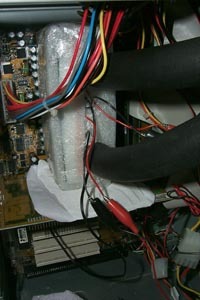 The program stresses calculations on the CPU and as a result induces a significant rise in temperature. 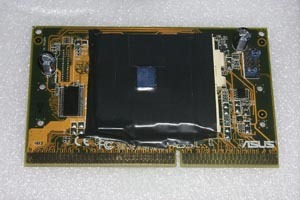 Seen above is the Celeron II mounted on the slotket adapter. 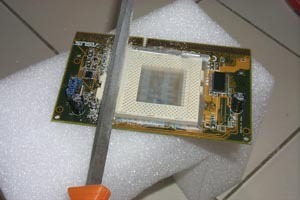 The chip has been taped around its core to circumvent condensation issues, while for insulation benefits the slotket was painted with PCB. 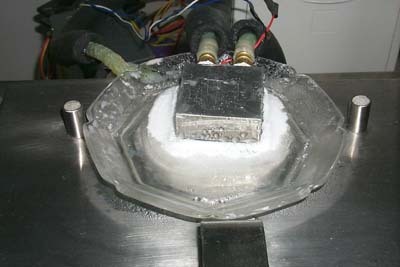 The 'cold plate' is a cheap method used to help reduce the CPU temperature from anywhere between 1 and 10 degrees celsius. 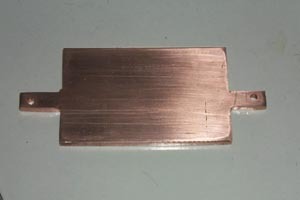 Lodged between the CPU and heatsink, the copper plate is an effective conductor that accelerates the transfer of heat away from CPU. Using the plate with the Asus slotket posed a problem, however, as there were two large capacitors on the adapter blocking its access. As a result the plate was sawed to fit the slotket. 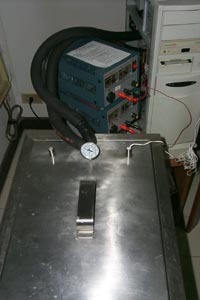 Two 80-watt TECs were used for this super cooler, their respective maximum rates at 16 volts, 8 amps. 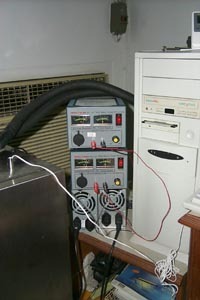 An adjustable power supply was also used; one PSU per TEC, supplying 15-16 volts and 10-12 amps. 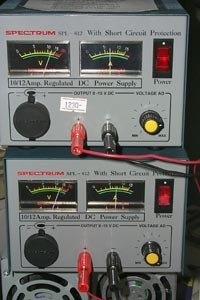 The two TECs each release 80 watts and the chip releases heat at around 70 watts, giving a total of 230 watts. The need to cool this system is getting more and more apparent. A compressor basin is used to cool the water (the reservoir has a capacity for 15 liters of liquid). Since water is being used (as opposed to another liquid coolant), WaterWetter was added to the cooler to help manage the heat. A product like WaterWetter improves the ability to wet cooling surfaces, thereby increasing the amount of heat absorption. 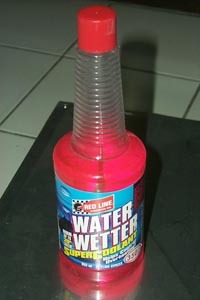 In addition, (unlike antifreeze) WaterWetter does not alter the boiling / freezing point of the water. 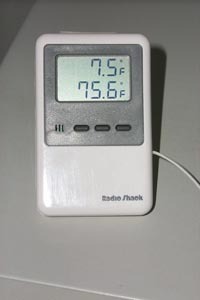 Above is the outdoor-indoor thermometer used to monitor the water temperature. The picture shows 7 F, but this was not the lowest point. Clearly, the compressor can manage 230 watts quite well. Komson says that he could further cool the compressor to -30 degrees celsius had he used antifreeze. The cool plate was put in a saucer filled with water. These pictures were taken half an hour later (note: the compressor reservoir was shut down for a day and a half, with one 72 watt peltier). As mentioned before, with peltier and other super-cooling techniques, condensation can become a serious problem. In this case, cell foam was wrapped around the slotket package in order to insulate the system and protect it from electrical shorts. 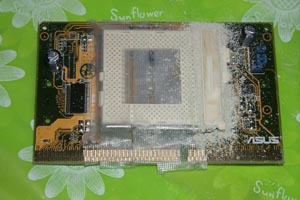 This type of insulation is an efficient solution, but Komson added an absorbable pad beneath the VGA card for extra protection. And lo, the system design was complete. 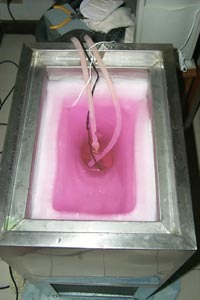 As things turned out, the system was able to be cooled all the way down to -46 degrees celsius. At this temperature, it was possible to push the Celermine 566 to 1148 MHz at 2.05 volts!! Below are the relevant screenshots. Mr. Plangsiri managed to super-water-cool his Celeron 566 to 1.148 GHz. 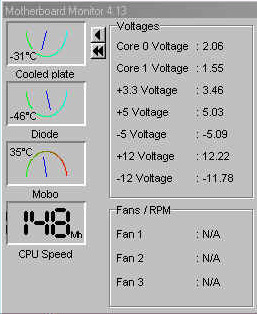 Clearly, this is not your average overclock and it's probably safe to say that a 1.148 GHz chip (overclocked or not) was a very rare occurrence at the time of this project (April 2000). If you would like to take on a project of this kind keep in mind that many other cooling techniques exist; it's simply a matter of choosing the appropriate method as a function of your budget and overclocking goal. If you have any questions on the process, be sure to post them on our message board, where you're almost guaranteed to receive a well-informed response from people who are more than happy to share their expertise and lend a helping hand.